This section walks you through deploying a sample application to Elastic Beanstalk using the Elastic Beanstalk Command Line Interface (EB CLI) and Git, and then updating the application to use the Geddy framework and Amazon ElastiCache for clustering. Clustering enhances your web application's high availability, performance, and security. To learn more about Amazon ElastiCache, go to Introduction to ElastiCache in the Amazon ElastiCache User Guide. This example creates AWS resources, which you might be charged for. For more information about AWS pricing, see https://aws.amazon.com/pricing/. Some services are part of the AWS Free Usage Tier. If you are a new customer, you can test drive these services for free. See https://aws.amazon.com/free/ for more information. The EB CLI is a command line interface that you can use with Git to deploy applications quickly and more easily. The EB CLI is available as part of the Elastic Beanstalk command line tools package. For instructions to install the EB CLI, see Install the Elastic Beanstalk Command Line Interface (EB CLI). Initialize your Git repository. After you run the following command, when you run eb init, the EB CLI recognizes that your application is set up with Git. Set up Geddy and create the project structure. The following steps walk you through setting up Geddy on a Linux operating system. Install Node.js. For instructions, go to http://nodejs.org/. Verify you have a successful installation before proceeding to the next step. For information about what Node.js versions are supported, see AWS Elastic Beanstalk Supported Platforms. Create a directory for your Geddy application. 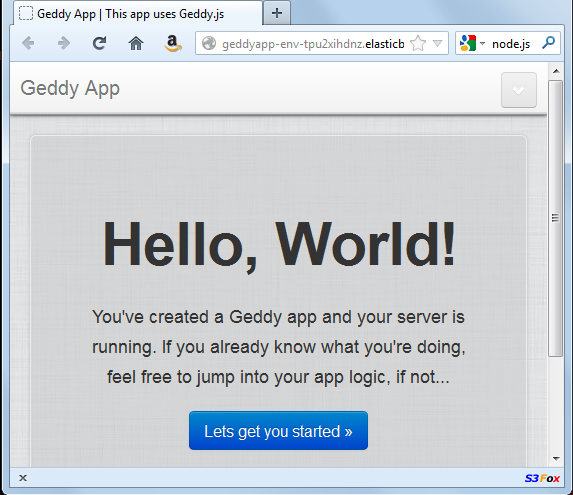 Install Geddy globally so that you have geddy generators or start the server. Depending on your operating system, you may need to set your path to run the geddycode> command. If you need to set your path, use the output from the previous step when you installed Geddy. The following is an example. Create the directory for your application. Start the server. Verify everything is working, and then stop the server. Press Ctrl+C to stop the server. Exclude the following files from being added to the repository. This step is not required, but it is recommended. The following instructions use the Elastic Beanstalk command line interface (EB CLI) to configure an Elastic Beanstalk application repository in your local project directory. From the directory where you created your local repository, type the following command. When you are prompted for the Elastic Beanstalk region, type the number of the region. For information about this product's regions, see Regions and Endpoints in the Amazon Web Services General Reference. For this example, we'll use US West (Oregon). When you are prompted for the Elastic Beanstalk application to use, type the number corresponding to the option Create New Application. Elastic Beanstalk generates an application name based on the current directory name, if an application name has not been previously configured. In this example, we use geddyapp. If you have a space in your application name, be sure you do not use quotation marks. Type y if Elastic Beanstalk correctly detected the correct platform you are using. Type n if not, and then specify the correct platform. When prompted, type y if you want to set up Secure Shell (SSH) to connect to your instances. Type n if you do not want to set up SSH. In this example, we will type n.
When you are prompted for the Elastic Beanstalk environment name, type the name of the environment. Elastic Beanstalk automatically creates an environment name based on your application name. To accept the default, press Enter. If you have a space in your application name, be sure you do not have a space in your environment name. When you are prompted to provide a CNAME prefix, type the CNAME prefix you want to use. Elastic Beanstalk automatically creates a CNAME prefix based on the environment name. To accept the default, press Enter. After configuring Elastic Beanstalk, you are ready to deploy a sample application. To update your Elastic Beanstalk configuration, you can use the init command again. When prompted, you can update your configuration options. To keep any previous settings, press the Enter key. After you have deployed a sample application, you can update it with your own application. In this step, we update the sample application to use the Geddy framework. You can download the final source code from http://elasticbeanstalk-samples-us-east-2.s3.amazonaws.com/nodejs-example-geddy.zip. On your local computer, create a file called node-geddy/myapp/package.json. This file contains the necessary dependencies. On your local computer, create a file called node-geddy/maypp/app.js as an entry point to the program. The preceding snippet uses an environment variable for the environment setting. You can manually set the environment to production (environment: 'production'), or you can create an environment variable and use it like in the above example. We'll create an environment variable and set the environment to production in the next procedure. The server should start. Press Ctrl+C to stop the server. myapp$ git commit -m "First Geddy app"
Your environment will be updated after a few minutes. Once the environment is green and ready, refresh the URL to verify it worked. You should see a web page that says "Hello, World!". You can access the logs for your EC2 instances running your application. For instructions on accessing your logs, see Viewing Logs from Amazon EC2 Instances in Your Elastic Beanstalk Environment. Next, let's create an environment variable and set the environment to production. On your local computer in your project directory (e.g., myapp/), create a directory called .ebextensions. On your local computer, create a file called node-geddy/myapp/.ebextensions/myapp.config with the following snippet to set the environment to production. Run "geddy secret" to get the secret value. You'll need the secret value to successfully deploy your application. You can add node-geddy/myapp/config/secrets.json to .gitignore, or you can put the secret value in an environment variable and create a command to write out the contents. For this example, we'll use a command. Update your Elastic Beanstalk environment with your updated option settings. Verify that your environment is green and ready before proceeding to the next step. On your local computer, create a configuration file node-geddy/myapp/.ebextensions/write-secret.config with the following command. Add your files to the local repository, commit your changes, and deploy your updated application. myapp$ git commit -m "added config files"
Your environment will be updated after a few minutes. After your environment is green and ready, refresh your browser to make sure it worked. You should still see "Hello, World!". Next, let's update the Geddy application to use Amazon ElastiCache. On your local computer, create a configuration file node-geddy/myapp/.ebextensions/elasticache-iam-with-script.config with the following snippet. This configuration file adds the elasticache resource to the environment and creates a listing of the nodes in the elasticache on disk at /var/nodelist. You can also copy the file from http://elasticbeanstalk-samples-us-east-2.s3.amazonaws.com/nodejs-example-geddy.zip. For more information on the ElastiCache properties, see Example Snippets: ElastiCache. Description: "Lock cache down to webserver access only"
On your local computer, create a configuration file node-geddy/myapp/.ebextensions/elasticache_settings.config with the following snippet. On your local computer, update node-geddy/myapp/config/production.js. Add the following line to the top of the file (just below the header). Then, add the following snippet just above modules.exports. On your local computer, update node-geddy/myapp/package.json to include memcached. myapp$ git commit -m "added elasticache functionality"
Your environment will be updated after a few minutes. After your environment is green and ready, verify everything worked. 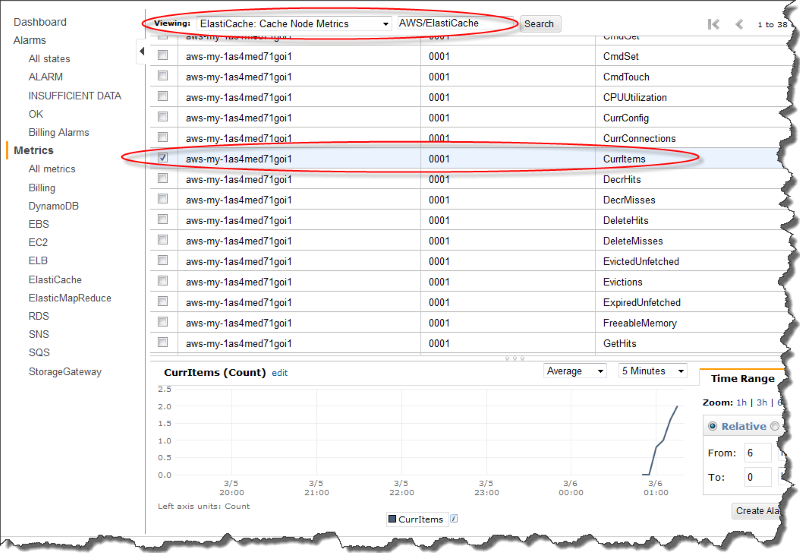 Check the Amazon CloudWatch console to view your ElastiCache metrics. To view your ElastiCache metrics, click ElastiCache in the left pane, and then select ElastiCache: Cache Node Metrics from the Viewing list. Make sure you are looking at the same region that you deployed your application to. If you copy and paste your application URL into another web browser, you should see your CurrItem count go up to 2 after 5 minutes. If you no longer want to run your application, you can clean up by terminating your environment and deleting your application. Use the eb terminate command to terminate your environment and the eb delete command to delete your application. From the directory where you created your local repository, run eb terminate. This process can take a few minutes. Elastic Beanstalk displays a message once the environment is successfully terminated.